A 25 year old gravida 3 para 2 living 1 and intrauterine fetal death (IUFD) 1 with twin gestation and tobacco addiction was diagnosed with carcinoma cervix in the second trimester. She had been referred to a tertiary level oncology center but had poor follow-up there. She presented to our center at 36 weeks with twin gestation and preterm premature rupture of membranes (PPROM). An emergency classical cesarean section was performed. She was stage 1B2 (bulky) carcinoma of the cervix. Her postoperative period was uneventful. She was referred for definitive treatment to an oncology center. Genital malignancies are rarely associated with pregnancy, the incidence estimated to be about 1/1000. However, carcinoma cervix remains the most common genital malignancy associated with pregnancy, second only to carcinoma breast (46%) and hematological malignancies (18%) in overall incidence . Lack of awareness regarding timely antenatal registration and routine Pap smear screening for cervical dysplasia often leads to patients presenting with advanced stages of cancer and late into the pregnancy. The obstetrician and gynecologist then face the challenge of balancing the well-being of the mother and the fetus. This case report attempts to highlight the major aspects of managing a patient with advanced stage carcinoma cervix in pregnancy. Our patient was 25 year old gravida 3 para 2 living 1 and IUFD 1 with twin gestation. After repeated episodes of painless vaginal bleeding and leucorrhea in the mid trimester at 20 weeks of gestation she underwent a cervical biopsy at a peripheral hospital in Gujarat. The histopathological diagnosis was a large cell non-keratinizing squamous cell carcinoma, after which she was referred to a tertiary level oncological center for further management. She paid a single visit there at which time her clinical stage was determined to be I B2 and she was advised further investigations like magnetic resonance imaging (MRI), which she did not get done, nor did she follow up there again. She came to our casualty twice, earliest at 30 weeks and refused admission on both the occasions. The patient was referred to the Tata Memorial cancer center in Mumbai. She visited the center once and was staged as carcinoma cervix 1B2. She was advised MRI and follow up. She neither got the MRI done nor did she follow up. She presented to us at 36 weeks gestation in labor and PPROM for one day. Uterus was over distended and two fetal heart sounds were heard. On speculum examination frank clear leak was seen along with an irregular friable fungating growth which had replaced both the lips of the cervix of about 4 X 5 cm size. The external os was obscured by the mass. The portio vaginalis was entirely replaced by the mass. However, the upper and the lower vaginal walls did not show any tumor deposits. The mass showed slight bleeding and profuse foul smelling discharge. Vaginal examination was not done due to the fear of precipitating torrential hemorrhage. Rectal mucosa was free. The patient was admitted and all laboratory investigations were sent. Her Hb was 8.1 g/dl for which she was transfused with one unit of packed red blood cells perioperatively. She was found to be VDRL reactive with a titre of 1:16. Her PT was 12/11.5 and INR was 0.58. After anesthesia fitness and high risk consent the patient was taken up for classical cesarean section. Two healthy male babies weighing 2 kg each were delivered with Apgar scores 9/10 each at birth. Intraoperatively there was no palpable mass or growth in the lower uterine segment or in the adnexa. Patient’s postoperative period was uneventful. The babies were screened for neonatal syphilis, were found to be negative and were advised follow-up after 6 weeks for repeat serum titers. The mother’s repeat VDRL titrer was also negative. The patient was kept in the ward for extended period till complete suture removal after which the wound was healthy. The patient was counseled regarding her illness, its prognosis and need for aggressive and complete treatment. She was advised to follow up at our center as well as the oncology center for chemoradiation therapy after discharge. She has not followed up at our institution and multiple attempts to contact her have been unsuccessful. The management of cervical cancer in pregnancy spans the full range of cervical neoplasia and treatment depends on the stage of the disease and gestational age at presentation. The patient’s desire to continue the pregnancy might produce a challenge for the gynecologist and meticulous counseling is necessary before the patient takes an informed decision. Nevertheless, when a diagnosis is reached in the first trimester delaying treatment poses significant risk to maternal prognosis. Screening for carcinoma cervix in high-risk populations is recommended but ideally all antenatal patients must undergo routine speculum examination at first visit since symptoms of pregnancy and carcinoma may be overlapping. Identification of high-risk factors like tobacco use (as in above patient) must be searched for at the first antenatal visit. Nevertheless as many as 8% patients may be diagnosed with carcinoma cervix without any suspicious symptoms. Clinical staging might be difficult because of inadequate per vaginal examination and hence examination under anesthesia might be a suitable option. However, FIGO staging of cervical cancer is still a clinical staging even in pregnant patients. Evaluation of a suspicious cervical lesion can be done by colposcopy, punch biopsy, conization, and/or non-invasive techniques like MRI or ultrasonography. The deleterious effects of Gadolinium contrast on the fetus is as yet undetermined. After a diagnosis has been attained the patient and spouse need to be counseled about their treatment options. They may be desirous of continuing the pregnancy, but should be explained that delaying treatment for more than 8 weeks in order to achieve fetal maturity is unacceptable. The importance of managing a carcinoma cervix patient at a specialized center cannot be over-emphasized. A team consisting of gynecological oncologist, medical oncologist, radiotherapist and neonatologist is essential in order to do justice to both mother and baby. Vaginal delivery is acceptable only in patients with pre-invasive disease or those planning post-partum fertility-preserving surgery. All other patients must deliver by cesarean section with concomitant radical surgery depending on the stage of the disease. Fetal pulmonary maturity must be confirmed before surgery. Classical cesarean incision is preferred and concomitant ovario-pexy must be done in view of future radiotherapy. The classical cesarean section prevents the risk of torrential vaginal bleeding, cervical tears and lacerations and risk of lympho-vascular dissemination of the cancer cells that can occur with vaginal birth. Considering the young age of these patients, surgical management is preferable to radiotherapy, if feasible, depending on the stage of the disease because of the added advantages of ovarian preservation and preventing radiation-induced vaginal fibrosis. Stages of carcinoma of stage IB1 and tumor size > 2 cm neo-adjuvant chemotherapy can be given till fetal maturity is achieved. Paclitaxel with carboplatin or cisplatin is the preferred treatment considering the tolerance and toxicity profile. The algorithm recommended for management of pregnant women with cervical carcinoma of stage IB1 and > 4 cm in size is to perform pelvic lymph node dissection and pelvic and aortic lymph node dissection and to give them neoadjuvant chemotherapy even if the nodes are negative. However, if the nodes are positive in pregnancy the pregnancy should be terminated irrespective of the gestational age as the risk of disease progression is high. It was unfortunate that our patient was a defaulter. Despite being diagnosed, counseled and referral to an oncology center prior to 20 weeks she did not persist in her definitive treatment. Her management misses were many. She could have undergone definitive treatment most likely radical hysterectomy with pelvic lymphadenectomy at 20 weeks of gestation at the oncology center in Gujarat after her biopsy diagnosed the lesion. However, she did not complete her treatment. She again lost two opportunities for admission and delivery at 32 weeks of gestation after administration of steroids for fetal lung maturity and subsequent definitive management. She did not get the MRI done as advised by the second oncologist at Tata Memorial hospital. A course of cisplatin and paclitaxel every 3 weeks for 6 cycles as neoadjuvant chemotherapy could have aided in the shrinkage of the tumor while awaiting fetal lung maturity and delivery. The recommendation of this platinum based chemotherapy is based on small case reports or case series. The neoadjuvant therapy should be avoided in the third trimester as delivery within less than 3 weeks after completion of the course is not recommended as the placenta does not get sufficient time to metabolize and eliminate the drug received by the fetus and also the maternal bone marrow does not have adequate time to recover from the side effects of the chemotherapy. However, she also did not receive any neoadjuvant chemotherapy for the above reasons. She was always accompanied by her 14 year old son. Her husband was negligent towards her health and she was apathetic towards her own health. Her emergency admission in labor was unfortunately on a weekend wherein MRI could not be performed and the proper staging in a suspected Stage 1B2 bulky lesion could not be ascertained. Classical cesarean delivery however was performed and her twins were delivered. 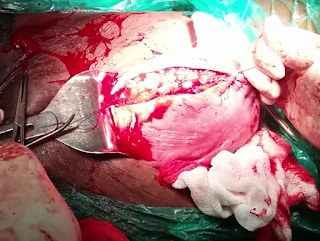 Considering that the patient was only 25 year old, had she been properly staged a radical cesarean hysterectomy with pelvic lymphadenectomy could have been considered as a definitive treatment. However, since the lesion was clinically staged as IB2 bulky, and the absence of an MRI the decision was taken to refer the patient to the oncology center for proper staging and chemoradiation after suture removal. The couple was counseled to take treatment from the oncologist but sadly she has not done so and also she is not contactable. Frequent pregnancies, failure to grasp the gravity of the situation, neglecting woman’s health issues are common features in the developing nations. Timely staging, use of neoadjuvant chemotherapy in pregnancy, close watch to detect progression of the disease, giving definitive treatment if disease progress is witnessed, avoiding vaginal birth in all cases except preinvasive and microinvasive lesions, performing classical cesarean births after fetal lung maturity and performing radical hysterectomy with pelvic lymphadenectomy along with classical cesarean sections in stage IA and IB1 lesions, referring the other stages for chemoradiation after childbirth can help in individualizing and strategizing the treatment of carcinoma cervix that is detected in pregnancy. Kehoe Sean, Peccatori F. Cervical and Endometrial Cancer during Pregnancy. In Surbone A, Peccatori F, Pavlidis N. editors. Cancer and Pregnancy. Berlin Heidelberg: Springer 2009. Vol 178 of the series Recent Results in Cancer Research. Pg 69-74. Gupta B, Rajaram S, Pregnancy and cervical Neoplasia. Rajaram S, Chitrathara K, Maheshwari A. editors. Cervical Cancer: Contemporary Management. 1st ed. New Delhi. Jaypee Brothers Medical Publishers (p) Ltd. 2012. Pp.281. Wiebe E, Denny L, Thomas G. Cancer of the cervix uteri. FIGO Cancer report 2012. Int J of Gynecol & Obstet 119S2, 2012;S100-S109. Sadugor MG, Palmer JP, Reinhard MC. Carcinoma of the cervix concomitant with pregnancy. Am J Obstet Gynecol 1949; 57: 933–938. Pentheroudakis G, Orecchia R, Hoekstra H-J, Pavlidis N. Cancer, fertility and pregnancy: ESMO Clinical Practice Guidelines for diagnosis, treatment and follow-up. Annals of Oncology. 2010;21(suppl5):v266-v273. ACOG Practice Bulletin No. 35: Diagnosis and Treatment of Cervical Carcinomas. Obstet Gynecol 2002; 99(5) part 1:855-867. Han SN, Gziri MM, Van Calsteren K and Amant F. Cervical cancer in pregnant women: treat, wait or interrupt? Assessment of current clinical guidelines, innovations and controversies. Ther Adv Med Oncol 2013; 5(4): 211–219. Karam A. Cervical Cancer in Pregnancy. Nov. 2015. Available from: www.uptodate.com/contents/cervical-cancer-in-pregnancy.